This is about the newly-opened restaurant called Project Pie, the first international franchise of Project Pie US, located at #515 Shaw Boulevard here in Mandaluyong. I see endless line of people every time I pass this store and they don't deliver so I was very much interested to pay a visit. Dragged hubby to this place for a quick dinner one rainy night and here's my honest review. In case you still don't know, Project Pie Mandaluyong is right in the front of the developing S & R Shaw or the former location of Cherry Foodarama. 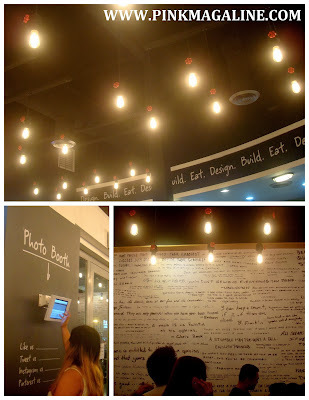 Inside Project Pie restaurant: I loved the uniformed lights, the photo booth (which uploads photos to their Instagram account) and the graffiti wall with lots of famous quotes. 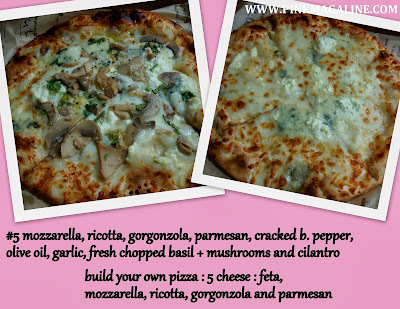 These are the artisan pizzas which hubby designed for himself. So far, the 5 cheese pizza is the best. I know I'm such a fan of melting cheeses. I can eat anything with MOZZARELLA. 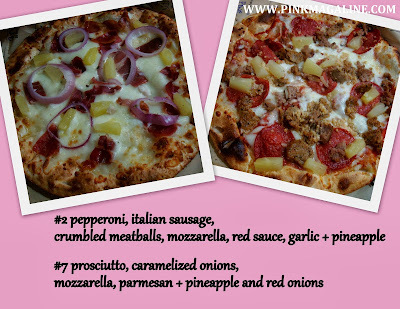 These are the pizzas which I customized for myself. Okay, unlimited topping is good, others even shamelessly made mountains of them, but the rubbery crust is not nice when it's already cold. In conclusion, I love the idea of making my own pizza, choosing any topping I want, without paying extra. The ambiance of the store is lively and the staff are friendly. Most of all, this pizza place is just a hop away from home. However, as much as I want to enjoy Project Pie's affordable artisan pizzas (less than P300 for a thin crust pizza in 4 slices), I can't stand their queue which is always long and quite slow. Imagine standing there for 90 minutes, waiting for your turn to get your order. People come in pack and they would occupy the seats while one of their companions line up. Oh, I saw a woman who just consumed her pizza while standing in the corner. No one bothered to offer her a seat. Shame on that guy in front of her with 2 more 'reserved seats' with his wife and kid still lining up. Sana pinaupo nya nalang muna yung ale di ba? Anyway, our pizza experience at Project Pie is something really unforgettable in a total of 100 minutes. Let say hubby and I walked from our house to #515 Shaw in 2 minutes, we queued for 90 minutes, they cooked our orders for 2 minutes, we ran home under the pouring rain for 3 minutes and then we ate the pizzas in another 3 minutes. Am I going back to Project Pie soon? No. I don't think so. Yay! I hate long lines pa naman. Hype lang kaya 'to? I want to try it also, been seeing pictures of this all over my IG feed e.
In 6 months time sis sa S & R na ako pipila. Hihi.